In 1963 a childhood trip to the movies in Yakima, Washington introduced me to Greece. It was Walt Disney's "Moonspinners" that sparked my love affair with Greece and firmly placed it high on my 'to visit someday' list. Luckily, our travels there in recent years have confirmed this country is as enchanting as I believed it to be so many years ago. I am spellbound at the sight of it's old windmills. Watching a line of working burros lumber past, I whisper, 'just like the movie'. 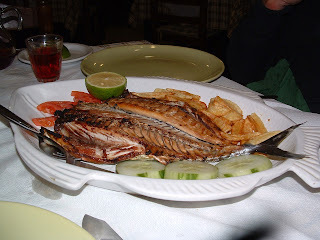 You know, it's the kind of family-owned place where the owners make you feel like you'd eaten there for years, the food is home-made; a place where the owner sings Greek songs, maybe does a little Zorba toe-tapping (because he is moved to do so, not as part of a tourist show). Oh yes, of course, the owner needs to be a fisherman as well to complete this idyllic place I sought out. This fall we found my 'perfect' Greek taverna! 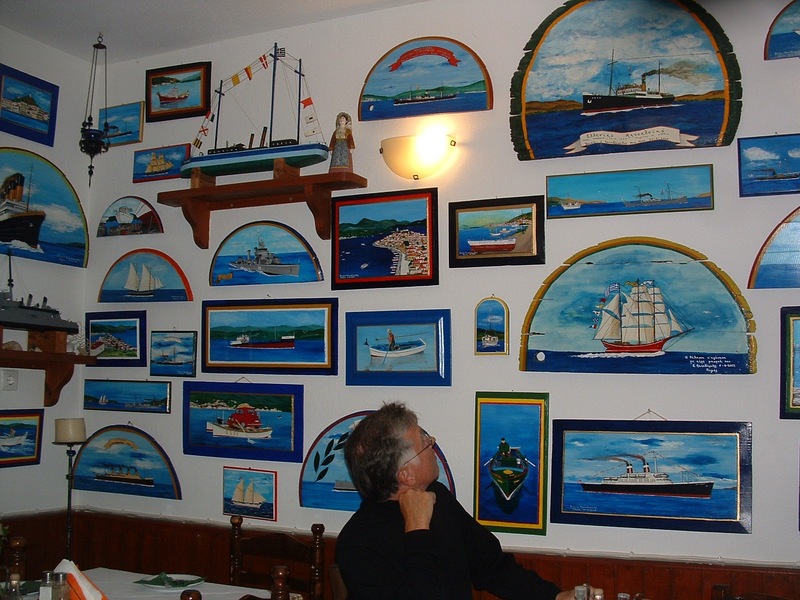 Apagio Taverna run by Liz and Spyros Papadopoulou on the Poros waterfront actually exceeded my expectations because not only did it meet all my requirements, but Spyros is also an artist. Each night was the same: a warm greeting from Spyros and Liz, time spent telling us about the fish he'd caught earlier in the day, then we were left to leisurely ponder the day's list of homemade offerings while munching from a basket of fresh baked bread and sipping wine poured from the small pitcher in which it was served. Spyros hummed. . .sometimes he sang, he stretched out his arms, snapping his fingers and doing a little dance while we continued to ponder our order. And occasionally we'd hear him raise his voice in the kitchen - it all added to the ambiance. 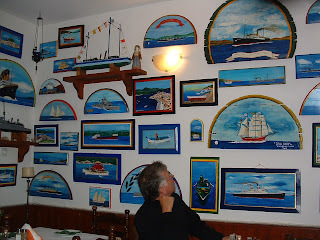 His paintings which filled the wall were inspirations he had while out fishing. And each night we reluctantly left after a few hours of dining and conversation with not only our bodies nourished, but our souls as well. Hugs and kisses were in order as we departed on our last evening. We told them we would be back. . .and, of that I am sure! Photos: Were taken by Jackie Smith, 2010, permission required for reuse. Zorba dance is a link to YouTube.com If you like that clip, we recommend getting the movie; it is great!. The post doesn't even come close to capturing the magical water-front setting on which the taverna is located. We were just there this spring and the taverna, its owners and the food were all just as we remembered them being: wonderful! I have the same response to those two colors, Irene. Thanks for visiting today. I'm happy to learn from you where I can find that movie-perfect taverna when (eventually) I'll get to Greece. That would be the type of experience high on my list.